I had my first morning meeting today. It was about the law firm stationery suite I’ve been working on. We are going to continue to have to versions, but one versions has three subversions because my supervisor wants to see an envelope with the address on the flap and an envelope with a flood of the blue color we’ve been using. There were some hierarchy issues and some crowding of the logo, but I think I sorted that out. It was a quick meeting and it was interesting to see that my boss still was a little bugged by the logo (that I didn’t design) and had to mention that too at the meeting where he was kindly reminded that we (company we) commissioned signage and that it would be inconsistent to change it now. The next step in that project is to pick the paper stock for the suite. Terry mentioned having a warm tan-ish color might be nice. They have some paperstock books and it’s up to me to go through them. 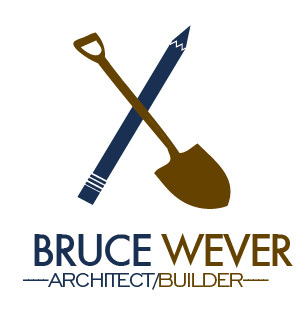 I had some imput regarding my architect/builder logo. (Above, seems most promising.) I’m trying to unite them with style and separate them with color as they are two partners working together. Why couldn’t they be “Bruce and Wever” and save me some time and them some money? Having two spot colors versus one spot color will cost them. As for the rest of the day, I’ve been reviewing my time log in frustration. Day 2, I decided to keep a timelog so I can look down and see what I’ve done for the day. I’ve decided to write “dillying”– short for “dilly-dallying” for all of the time I end up looking at art blogs and checking and rechecking my Facebook. I’m looking at my log and realizing that I lost my whole afternoon. This internship is a slow-starting thing. I was told that they hired me partially because my resume has a lot of WordPress stuff on it and they were into that. I haven’t seen any of that kind of work yet and it doesn’t feel like it’s my place to bug them because I am bored. Maybe I just need more coffee. Tomorrow is another day. Having a creative job is an evolving process. I am not the first or the last person to be intimidated by a blank piece of paper.